Services - F. Trottier Construction Ltd.
Our emphasis is on professional design & quality packaged with first class personal service. We offer you commitment, dedication, superb craftsmanship, consistently high quality standards without comparison and exceptional customer satisfaction. FTC’s team of professionals determines the feasibility of every project, no matter the size, and establishes parameters given the overall objectives of the client. From small fit-up projects to construction of major headquarters and complexes, FTC’s experience ensures that the right decisions are made and funds are wisely spent. To this end, our depth of expertise and sophistication provides clients with the tools necessary to make informed decisions. Below is a full summary of our available services. If you don’t see what you’re looking for, please don’t hesitate to contact us! FTC is one of the Region’s finest construction companies with years of experience as a licensed general contractor in ICI construction projects in both the province of Quebec and Ontario. We can help realize your vision. As the general contractor, FTC provides a confirmed price–after design is complete and before construction begins. FTC executes the project and generally assumes the risk of cost overruns based on clearly defined budget and scope parameters. The client is responsible to retains an architect or engineer to design the project and to prepare the necessary drawings and specifications. After the architect/engineer completes the drawings and issues them for pricing, the client selects the general contractor through a sole source or a competitive bid process. This early collaboration in the construction management process promotes effective project coordination and communication from the start, creating an environment for success. FTC is a flexible construction company that will operate under various contract types and fee structures (e.g., cost plus, guaranteed maximum price, percentage fee, and fixed fee) to meet the client’s needs. As construction manager, FTC applies its construction management expertise in the areas of construction costs, schedule, and market trends to help ensure the project is executed within your fiscal guidelines. FTC’s goal is to value engineer projects to find alternative construction methods and materials that will result in quality enhancements, serviceability, and life cycle improvements. FTC provides advice on all project costs, minimizing the risk associated with having an incomplete scope of work during preconstruction. The final cost, however, remains the decision of the Client, as all project costs are typically reimbursable. FTC Clients can select a design-build arrangement when they want to work with one contract entity, instead of several contractors and consultants. As the design-builder, FTC provides comprehensive design and construction services through one point of contact by bringing all project team members together in the design phase to help foster a more successful partnership. Drawing on the team’s combined expertise, FTC addresses project design and building construction requirements, within the budget and schedule parameters, resulting in less potential for project escalation. Also, FTC can implement a fast-track approach, starting construction before the total design is complete. This is important if you require the delivery of a cost-effective, quality facility on a reduced schedule. FTC has a strong track record of delivering superior projects tailored to customers’ specific needs. The company has constructed build-to-suit facilities for a wide variety of customers. We can tailor and manage the full build-to-suit life cycle and turn-key solution, including site selection, land acquisition, facility specifications, permitting, construction and ownership. 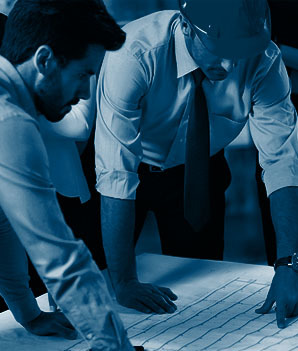 FTC Project Managers bring a unique set of capabilities when serving as the owner’s representative, ensuring compliance with design specifications and contract terms, while carefully managing risks and controlling costs. Our qualified PMs are professionally trained in all aspects of construction to manage procurement, monitor progress and schedule, cost, and quality of ongoing construction projects, while overseeing construction contractors. In addition, we provide value engineering, quality assurance, and dispute resolution. We are committed to achieving the highest safety standards on all our projects, using proven, leading-edge technologies and behavior-based safety practices to reduce risks to our employees, clients, and surrounding communities. FTC have architectural and engineering professionals on staff that can provide advice for all your real estate needs. We can accommodate any type of real estate consulting mandates to facilitate any long term or short term planning objectives, change management assistance, process analysis, strategy development, or operational improvement services for any type of business mandates in the ICI industry. Our extensive knowledge of the construction industry combined with our own proprietary methodologies and frameworks can help you guide the identification of problems and to serve as the basis for recommendations for more effective or efficient ways of performing the work or tasks. Want to run your project idea by our team? Have something in mind not covered by the services above? Reach out anytime, FTC wants to work with you!